The Ponca City Area Crime Stoppers recently kicked off a fundraising campaign for 2019. “Crime Stoppers is working for our Community,” said Crime Stoppers Board Chair Kelly D. Ailey. Crime Stoppers was created in 1984 as a group of volunteer citizens dedicated to involving the public in crime prevention. The program is run strictly on donations, and the public’s help is needed. “Your monetary donation to the program will help fund rewards paid on tips that result in arrests or the recovery of stolen property of illegal drugs in the coming year,” Ailey said. Crime Stoppers empowers people to make their neighborhoods, schools and business safer through anonymous information about crimes. Tips provided information about drug-related crimes, burglaries, armed robberies, domestic abuse or assaults and inhumane treatment of animals. Ailey said there has been an uptick in tips in the last couple of years regarding children and adults who may be suicidal. The board has approved many rewards for tips which helps ensure that these individuals get assistance. The arrests made as a result of the tips represent criminals and drugs taken off of the streets of our community, Ailey said. It also represents stolen property returned to citizens of Kay County. 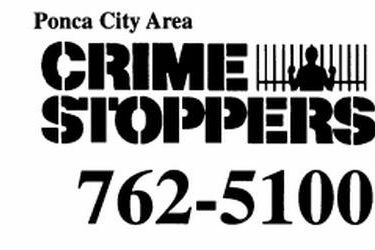 Crime Stoppers tips assisted the Ponca City Police Department in solving crimes that affected every neighborhood and every type of business in the community. The organization also sponsors and funds the Campus Crime Stoppers programs at the middle school and high school levels in Ponca City. This program has provided tips involving drugs, alcohol , tobacco, weapons and potential mental health issues. Current Crime Stoppers board members are Kelly Ailey, Chair; Dwain West, Vice Chair, Carole Jeffries, Treasurer; Tina Stracener, Secretary; Larry Bittman; Jim Kelly; Mark Love; Harriet Simpson; Tamara Wink; and Julius Wright. The board meets on the first Thursday of each month at 7:30 a.m., at the Ponca City Chamber Board room. Anyone is welcome to attend. Please consider a “tax deductible” donation today and help Crime Stoppers make the community safer. Donations to PCACS can be sent to 200 East Oklahoma Ave., Ponca City, OK, 74601.